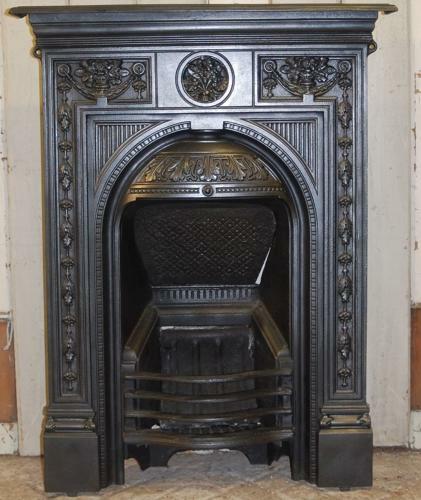 A very pretty, cast iron, Victorian combination fireplace with a very attractive design. The fire is the perfect size for a bedroom or smaller reception room. The fire has a very pretty domed smoke hood with a leaf design. The cross bar and legs have very ornate, Adam style, flower and swag pattern and a central medallion, in a design typical of the era. The fire opening has a decorative border and the fire has the original shaped front bars and both fixing lugs. The back has an RD number, RD58060, dating the fire to 1886. The iron has been blacked and polished and has a rich colour and nice finish. The fire is in very good, useable, condition but does have some slight damage and signs of wear consistent with age. The fire has some small casting marks, tarnish and scratches. The back has had some repair, and the new bolts near the base can be seen when looking at the back of the fire. The concrete fire back has some very slight damage to one top corner, some marks, chips and a small gap at the top where it joins with the iron. Some small marks and tarnish are present at the front. The fire back has surface rust as expected. Suitable for a bedroom and ideal for a period property, the fire is a very desirable item. A fine example of Victorian design.